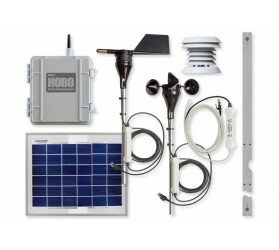 The HOBO RX3000 Weather Station Starter Kit provides instant access to site-specific air temperature, relative humidity, and wind speed/direction data anywhere, anytime on your desktop or mobile device. The RX3000 accepts up to 10 plug-and-play Smart Sensors. Just plug in your sensor and it’s automatically recognized – no programming, wiring, or calibration necessary.This weather station kit includes a one-year cellular data plan plus cloud-based data access through HOBOlink – for 24/7 access to your data and the ability to verify RX3000 system status, set up and manage alarm notifications, and schedule automated delivery of data.